Board of Education Appreciation Month! 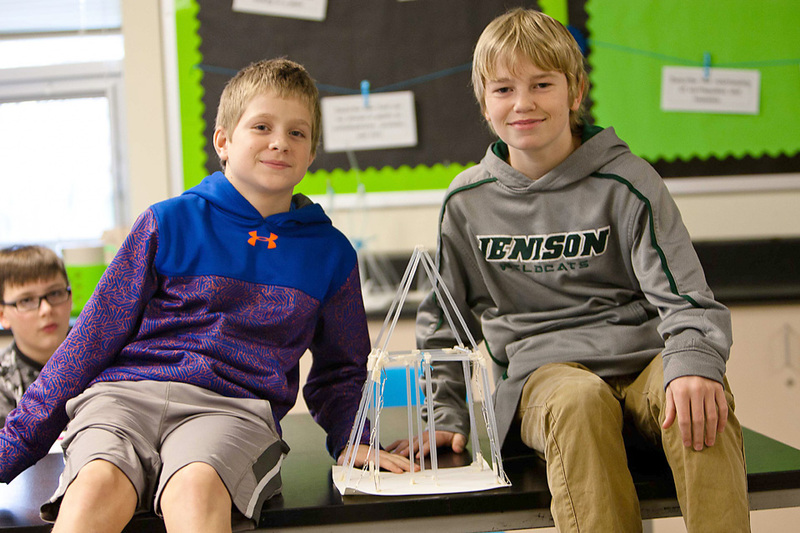 As citizen leaders, members of the Jenison Public Schools Board of Education continue to face complex and demanding challenges. Their extraordinary dedication to Jenison Public Schools is greatly appreciated. The job of a school board member is tough, the hours long and the thanks few and far between. Too often we’re quick to criticize school board members without really understanding the complex nature of their decisions. We often forget about the personal sacrifices school board members make in fulfilling their responsibilities. Jenison School Board members contribute hundreds of hours each year leading our district. The time spent in board meetings represents just a small fraction of the time school board members spend helping to lead our district. The month of January is set aside to time to thank them for their untiring efforts. This is a time to show our appreciation and begin to better understand how local trustees work together to prepare today’s students to be tomorrow’s leaders. Join with others from our district and throughout the state to salute the men and women who provide grassroots governance of public schools. As further evidence of their dedication, be looking for a post at the end of January on an important, upcoming Bond Issue. Thank you, Jenison Board of Education members for putting our students and their education at the top of your priority lists! We are so grateful for you! Introducing four more new teachers with Jenison Public Schools this year! 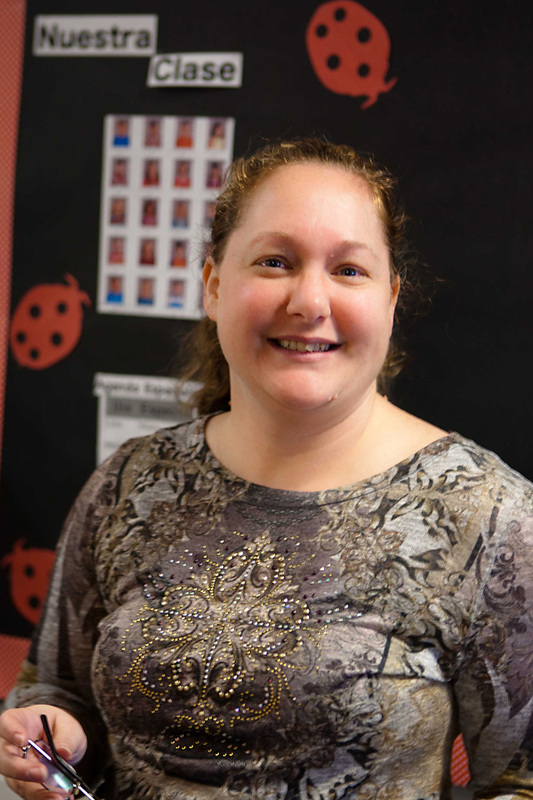 Mary Lynn Randall comes to the Early Childhood Center after four years of teaching in the Ludington school district. Now, she spends her days with our Pre-K [or transitional Kindergartners]! Her husband was commuting to work from Ludington to Grand Rapids and after they had their daughter they knew it was time to make a change. She had heard good things about Jenison from her sister, Ashley Hankamp, who teaches art at Bauerwood and Pinewood and she knew it would be a good fit. Mary Lynn is encouraged by her students “eager minds and energetic spirits” and thoroughly enjoys being part of the Jenison family. When Mary Lynn isn’t wrangling the energetic spirits of her Pre-K students, she is true to her farm-girl roots and enjoys spending time with her family in the outdoors hunting, fishing and scoping out good auctions. 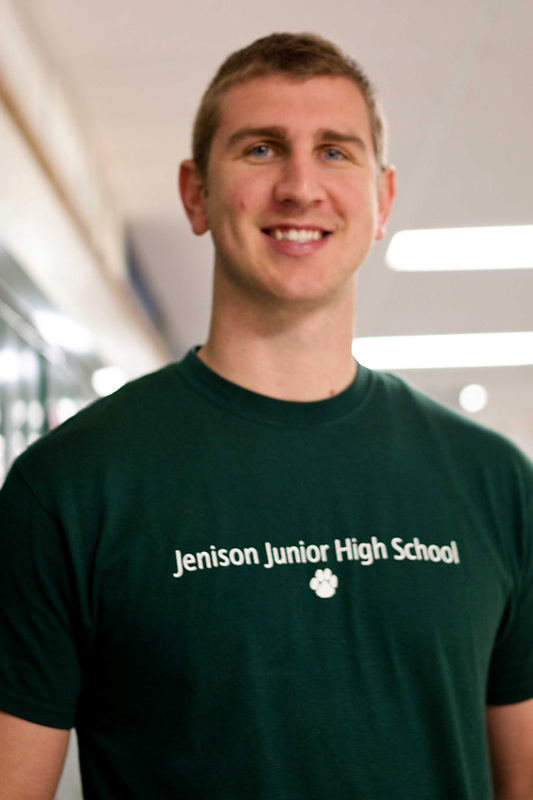 We are so thankful to add these teachers and their passion for educating to the Jenison family! Introducing three more new teachers with Jenison Public Schools this year! 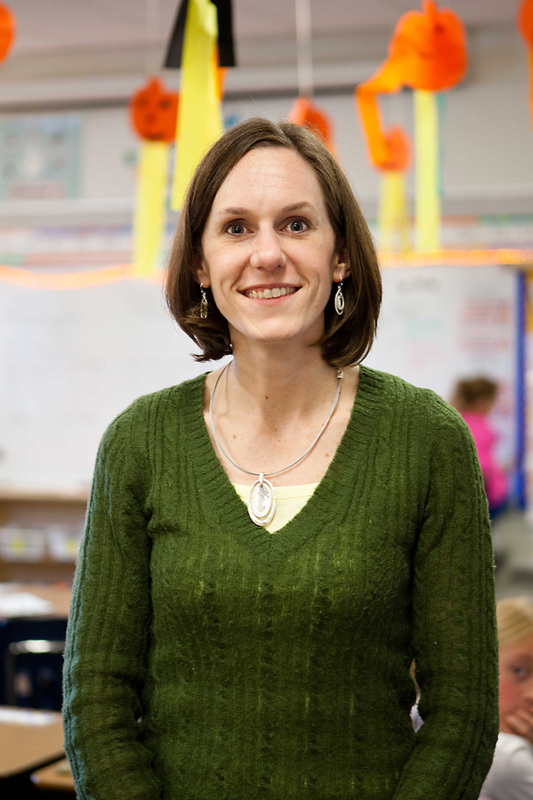 Before joining the second grade Spanish Immersion class at Rosewood, Beth Zuwerink was teaching in Rockford Public Schools. She had taken some time off to raise her son and missed Spanish Immersion so she decided to return to the classroom this year. 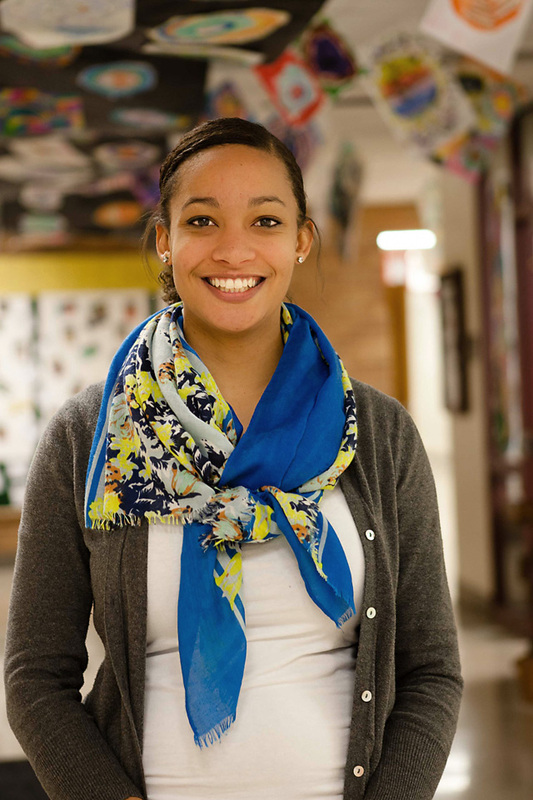 “I am looking forward to helping my students grow as students and as individuals. As I watch my son grow and develop, I’m even more reminded of how special and unique each child is. I feel blessed to be able to get to know each of my students and to help them realize their full potential. And, of course, I am also looking forward to all those goose-bump moments that come as I watch my students’ Spanish language skills progress!” Beth is ‘hugely passionate” about immersion education and Rosewood students are lucky to have her on their team! 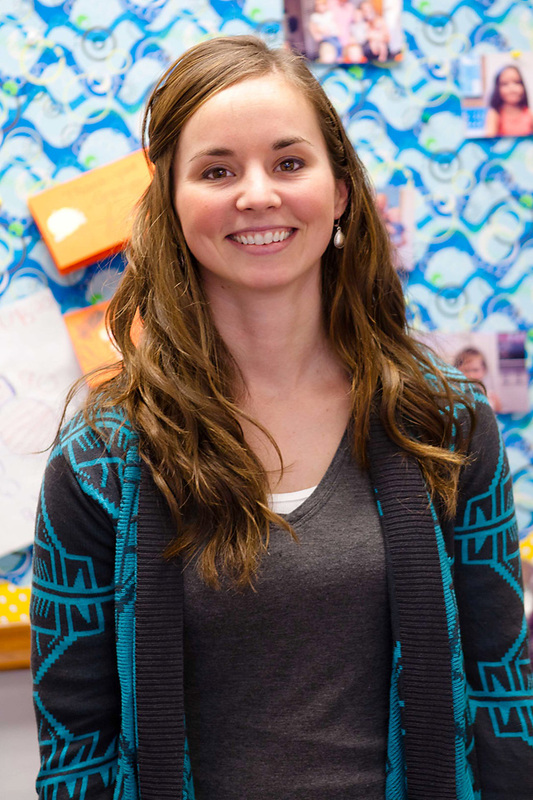 Samantha [or Sami] Duval is a new Fourth Grade teacher at Bursley Elementary. 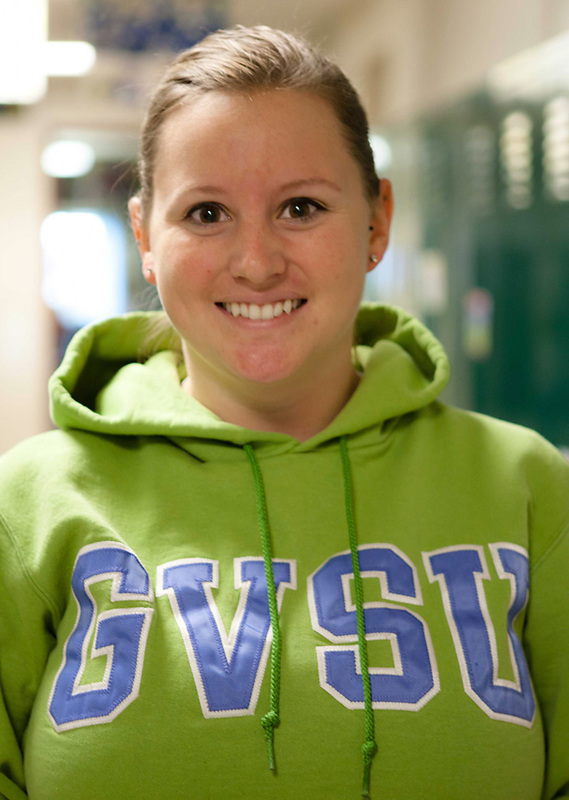 Like Olivia, Sami spent her student teaching and a period of long term subbing in Jenison at Rosewood and Bursley. 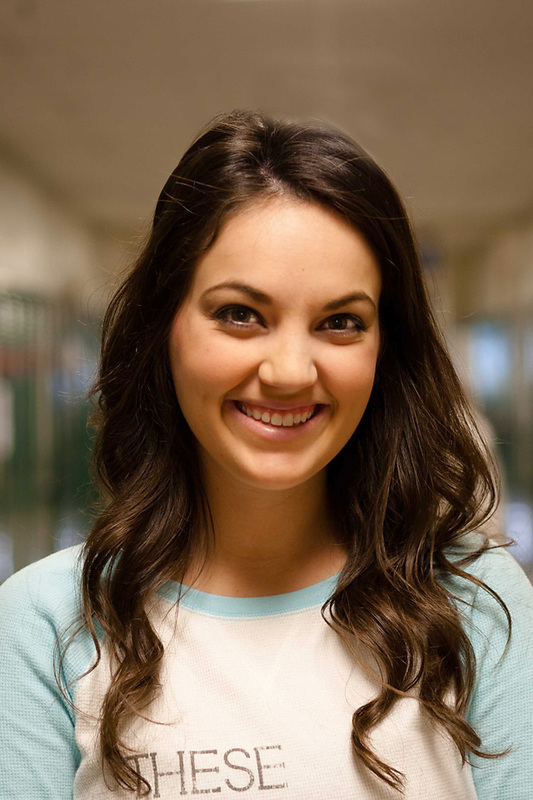 “The first time I walked into the building I knew Jenison was a great place to be as I was surrounded by such a kind and welcoming staff.” Sami also took some time coaching the JV Cheerleading team and as the assistant coach for the Varsity team. So far this school year she is already inspired by her students: “[They] are so kind and giving. They took Kid President’s Socktober challenge and they collected 680 pairs of socks to give to the homeless. Watching the joy in their faces as they counted socks everyday was such an amazing experience.” When Sami isn’t teaching she is spending time with her husband, their dog, Rosco, and drinking Biggby coffee. Thank you to all of our teachers for sharing their passion and talent with our community! 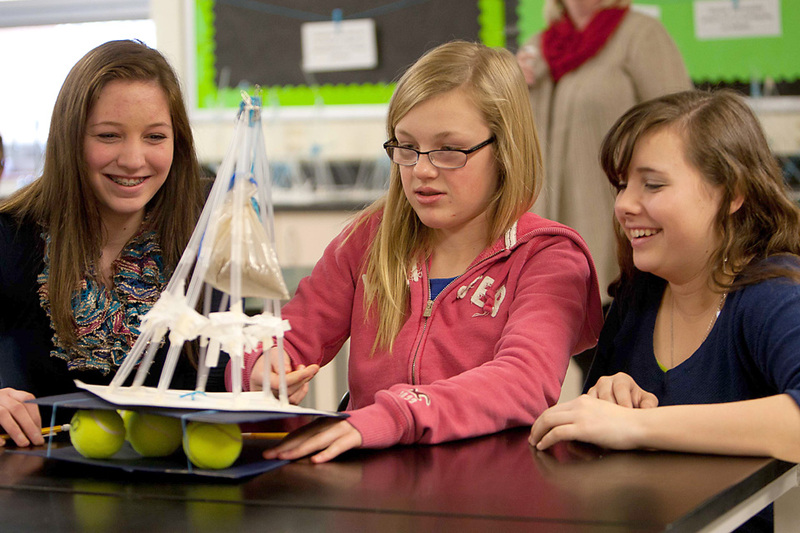 Junior High Teacher Named Science Teacher of the Year! 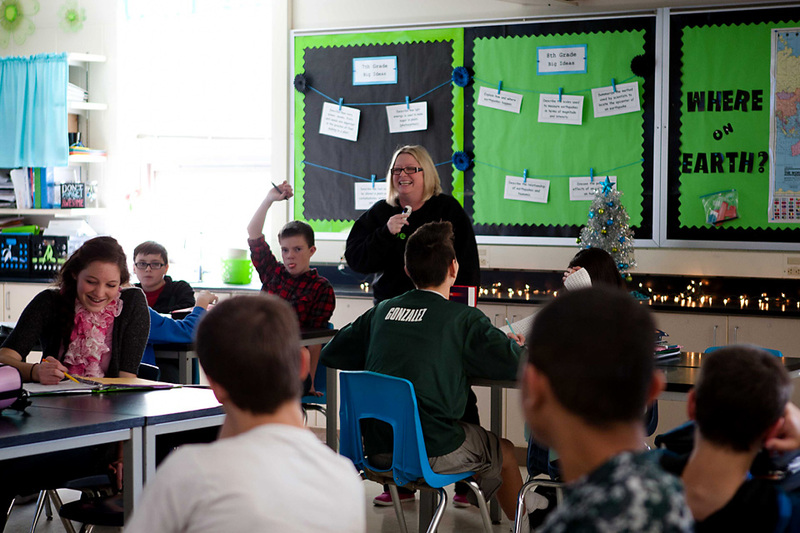 The entire district and especially Jenison Junior High is so proud to announce that Holly McGoran has been named by the Michigan Science Teachers Association as the 2015 Middle School Science Teacher of the Year! After the nomination was made Holly had to submit her resume and teaching philosophy, which she did somewhat reluctantly as is her humble nature. 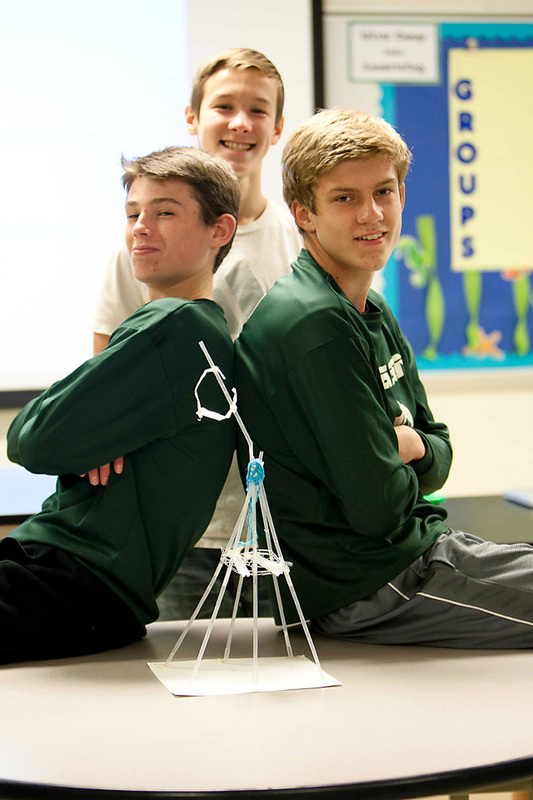 8th grade students with their “earthquake proof” structures they made from straws, paper clips, string and masking tape in Ms McGoran’s class. Please join us in congratulating Holly for this incredible honor!